Our recent look at the Radeon RX 460 GPU highlighted the truth that you needn't spend thousands of pounds on a PC to avail yourself of a solid games-playing experience. For comfortably under £600, including Windows 10, one can game at 1080p with enough horsepower to play first-person shooters smoothly. Affordable monitors equipped with FreeSync technology - adaptive framerate is not available for consoles - means that the first foray into PC gaming waters should be good, with the ability to make it great by upgrading the graphics at a later date. So given that RX 460 is a capable enough GPU, which one would you choose? Good question, and one that we are answering in this review of a plethora of partner cards. We have Asus, Sapphire, Gigabyte and XFX all ready for perusal today, so let's get right to it. 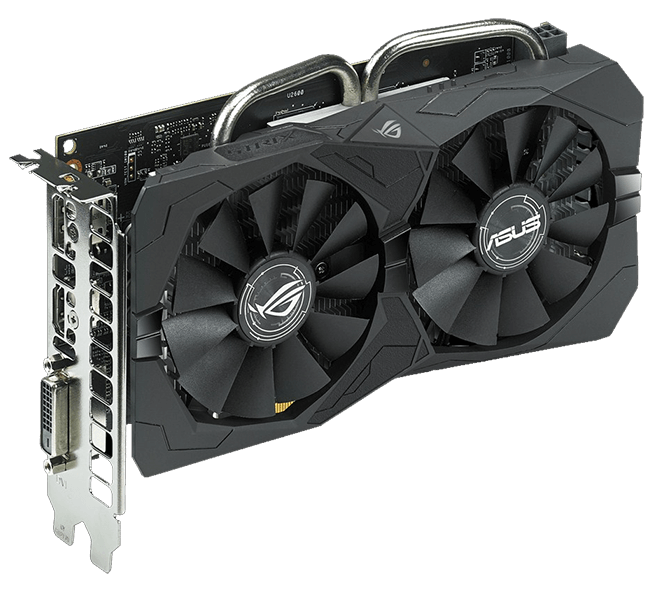 First off the bat, alphabetically, is the Asus, and as you will know, the card we have is the ROG Strix OC 4GB. The model number ends in 04G, differentiating it from the lower-clocked 4G, meaning that it ships with a 1,236MHz core speed (gaming mode) that rises to 1,256MHz through the OC mode activated by the accompanying GPU Tweak II software. Memory, meanwhile, is left at a standard 7,000MHz, which will become a common theme. Both Asus cards are identical in appearance, mind, and both attract a solid price premium over other brands such as Gigabyte, MSI and XFX. A case in point is the review model, priced very close to £150, so about £25 dearer than an equivalently-clocked Sapphire. Value is definitely a concern at this end of the market, yet Asus believes it offers enough extra to warrant it. Drilling down, the Strix is typical in stature for a card of this ilk. Measuring just under 20cm long and presented in a standard dual-slot form factor, it'll fit into all but true mini-ITX chassis. Given that Asus elevates the core frequency compared to a reference card, the Taiwanese giant adds a six-pin power connector. Ideally, we'd rather see the card without. 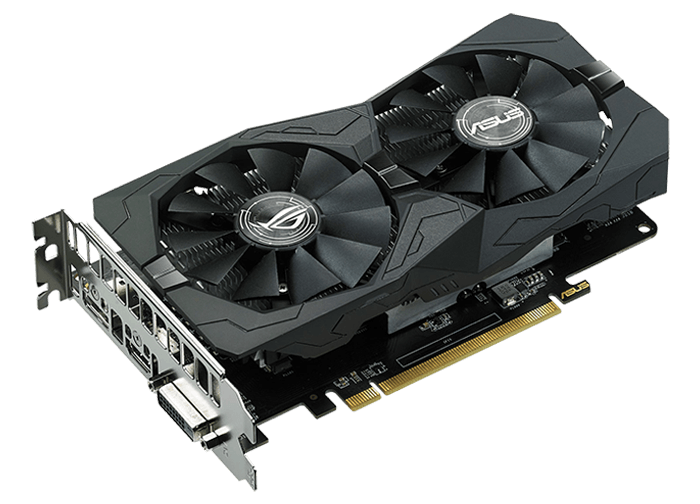 The meagre load imposed by the GPU means this card is equipped with the DirectCU II cooler whose two vertically-aligned, centralised copper heatpipes attach to the core and make solid contact. A secondary heatsink cools the VRMs separately. It's a popular design also used on the RX 470, as far as we can tell, and does have the advantage of turning both fans off when temperature is below 60°C or so. Indeed, even when working, they spin slowly and the card can barely be heard. A couple of other features mark this card out. The first is FanConnect, where the PCB has a single 4-pin GPU-controlled header connected to system fans for better thermal performance. It's a neat idea that zones cooling. The second is RGB lighting, known as Aura, which provides a near-infinite choice of colours. The small LED is positioned right in the middle of the card, behind the logo. The effect is subtle and not as all encompassing as on, say, a motherboard or higher-end card, though still looks reasonable if you're into side-windowed chassis. Ports wise, it includes dual-link DVI, HDMI 2.0b and DisplayPort, and you'll see this as the standard configuration for almost all RX 460s.